Another great weekend of racing was held at Brightlingsea Sailing club for the Zhik UK Tornado National Championships last weekend. Friday saw two races held in total, the first race was in mixed conditions from 8 knots to 15 knots. Towards the end of the first race the breeze appeared to be dropping. The race officer got the second race off to a quick start and the breeze filled in to make some fantastic racing for the fleet. Plenty of trapezing upwind and downwind for the sailors. At the end of day one it was Pete Jary and John Gimson who lead the way with two race wins. Saturday morning was a waiting game with no breeze arriving until around 12.30. The boats launched at 2pm to a building breeze. The first race was held in tricky conditions where picking the right side of the race course was key. The fleet had close racing with contestant position changes at the back of the fleet. Again it was Pete Jary who took the win in 1st. Steve Glynn and Mitchell Glynn fought a downwind battle between 2nd and 3rd with Steve just pipping the Dinghy Rope team to 3rd place by half a boat length. The remainder of the fleet came from behind to bunch up making the fight for 4th interesting. After one race the race officer and his team sent the fleet back to the sailing club. Sunday looked to be a repeat of Saturday with light winds in the morning at the sailing club. Just across the creek we could see a flag on top of a church which was flying, it looked promising for more wind to be around the corner on the race course. There was no postponement flag so the fleet headed out to the race area. The race committee managed to fit in four races on the last day, one more than the schedule to make up for the races missed on Saturday. 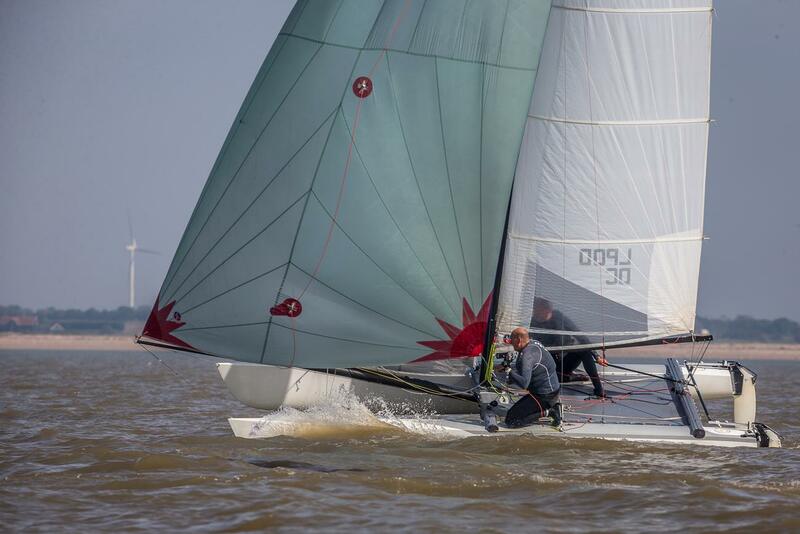 It was close racing for everyone in the fleet with constant position changes, Pete Jary and John Gimson nearly lost their perfect series score but just managed to squeeze past Steve Glynn and Tom Duckmanton in race five. 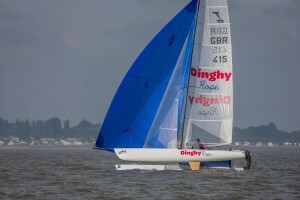 Further back Kevin Dowley and Tom Brooks had their best result of the series in race four with a fourth place finish, they were then unfortunately hampered by a problem with their kite in the remainder of races for the day. Over the weekend every sailor learnt something new and the racing was closer than ever with plenty of position changes throughout the races. Looking at the final score board there was only one point between 2nd and 3rd and 4th and 5th. 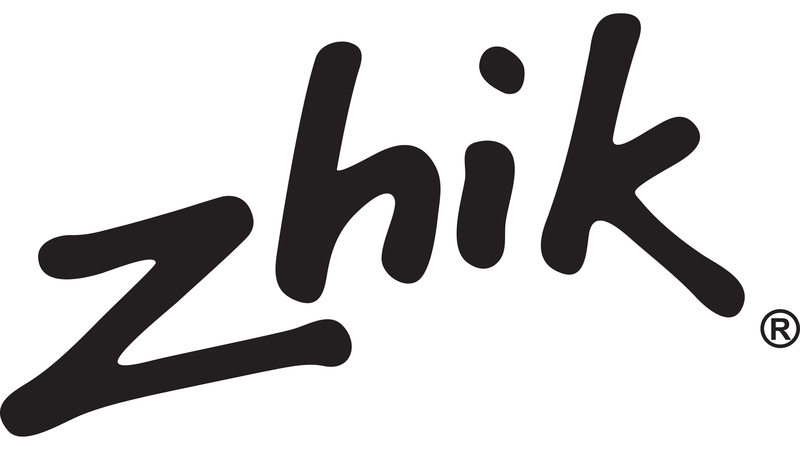 A big thank you to Zhik for sponsoring the event and to Brightlingsea Sailing Club for a great weekend. Photos courtesy of Dave White.